Kafka used to say to Janouch: ‘I have nothing definitive’. This remark by a writer sends us back to two types of behaviour, two themes, two discourses: Hesitation, which I have just talked about, and Oscillation, which I am going to talk about. Although I do not want to go into detail about this ‘case’ since it involves a close friend, someone whom I like, esteem and admire; and also because it involves a ‘hot’ problem, what one might call an ‘image in action’, I think I should say a word about Sollers, asking that he should be interpreted within a serious intellectual context and not according to people’s moods and fits of bad temper. This serious intellectual idea is precisely that of Oscillation. Sollers, in fact, seems to give the impression of a series of sudden palinodes which he never explains, thus producing a kind of ‘electrical interference’ which disconcerts and annoys intellectual opinion. What does this mean? I should here like to make two remarks. The first is that, by his ‘oscillations’, it is obvious that Sollers calls into question the traditional role of the intellectual (his ‘role’, not his ‘function’). From the moment he emerged as a social entity (that is to say, since the end of the nineteenth century, and more precisely since the Dreyfus case) the intellectual has been a kind of prosecuting attorney on the side of the angels. I am naturally not trying to call into question the need for the intellectual to act as he does. What does interest me is the possibility of disturbing the splendidly robed figure of an impeccably clear conscience. 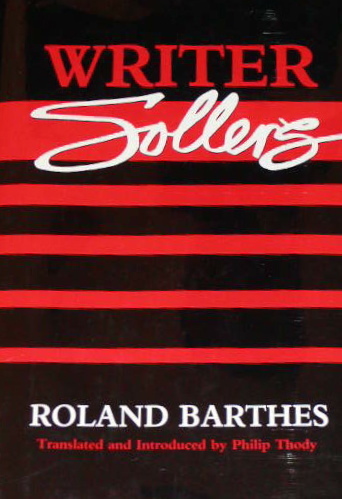 Now it is perfectly obvious that Sollers practises a ‘life writing’, and introduces into this writing what Bakhtine calls a ‘carnival-like dimension’. He suggests to us that we are entering into a phase of deconstructing, of deconstructing not the intellectual’s action but his ‘mission’. This deconstruction can take the form of a withdrawal but also that of a jamming, of a series of decentred statements. All that Sollers is doing is, in fact, putting into practice a remark in the People’s Daily, quoted as an introduction to an issue of Tel Quel: ‘We need wild devils, not tame sheep’. The jolt deliberately given to the unity of intellectual discourse is imparted through a series of ‘happenings’, aimed at disturbing the superego of the intellectual as an emblem of Fidelity, of the moral Good — at the cost, obviously, of an extreme loneliness. For the ‘happening’ does not form part of that practice which I would one day like to see analysed in a study which might be called ‘The Ethology of Intellectuals’. The second remark is that through a music which is, as it were, made frenzied through Oscillation, there is in Sollers, I am convinced, a fixed theme: writing, de­votion to writing. What is new here is that this inflexible submission to the practice of writing (a few pages of Paradis every morning) no longer forms part of a theory of Art for Art’s sake, or a measured and ordered commitment (novels, poems on one side; signatures on the other); it seems to go through a kind of radical madness of the subject, an endless series of unending and unwearying involvements. You are present at a mad struggle between the ‘inconclusion’ of attitudes, these being exaggerated of course, but whose succession always remains open (‘I have nothing definitive’) and the weight of the Image, which invincibly tends to solidify; for the destiny of the Image is immobility. To attack this immobility, this mortification of the image, as Sollers does is a dangerous, extremist action whose extremity inevitably recalls the gestures of certain mystics such as El Hallaj, gestures which are in­comprehensible from any common-sense point of view. The intelligentsia puts up a very strong résistance against Oscillation, while it is very happy to accept Hesitation. Gidean hesitation, for example, was very well tolerated, since the image remained stable: Gide produced, as it were, the stable image of something moving. Sollers, on the contrary, wants to stop the image solidifying. In short, everything takes place, as it were, not on the level of content, of opinion, but on that of images: it is the image which the community always wants to save (whatever community it may be), because it is the image which is its vital substance and is becoming more and more so. In its state of overdevelopment, modem society no longer feeds on beliefs (as if did formerly) but on images. The Sollersian scandal is caused by the fact that Sollers attacks the Image — seems to want to prevent, from the very outset, the formation and stabilization of every image; he rejects the final image possible: that of ‘the-man-who-tries-every-possible-direction-before-finding-his-definitive-way’ (a noble myth of progress on life’s way, of initiation: ‘after much wondering, my eyes opened’). Sollers becomes, as they say, ‘indefensible’.